Situated at the Power Boats facility in Chaguaramas, SAILS RESTAURANT & BAR has the trappings of a typical boatyard waterfront restaurant – a very casual setting and an American-style menu of seafood and steak entrees alongside appetizers/sides like salads, chicken wings, wedge fries and fried cheese sticks. Take our advice, bypass the fried fare and start with the creamy Callaloo Soup ($32) and Mussels ($68). Good choices for entrees include the tender, meat-falling-from-the-bone barbecued Baby Back Ribs ($105 for a half-rack) and the King Fish Supreme with garlic butter ($165), both flanked by huge baked potatoes and side salads. Vegetarians can try the Veggie Plate ($62) and we promise that you’ll be too stuffed to even consider dessert. Sunday Grill/BBQ Night at SAILS RESTAURANT is also a must-try with its menu of grilled fish (catch of the day), lobster, shrimp and ample sides. It’s the perfect end to your week as you watch the sun set and ‘limers’ returning from down the islands. 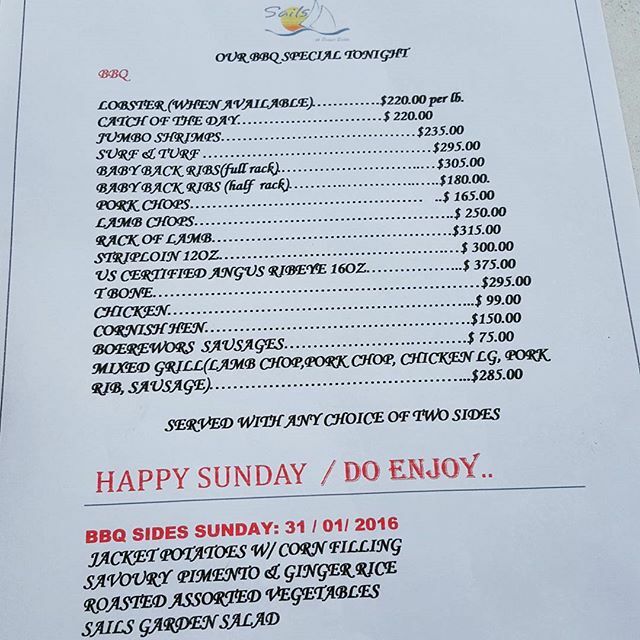 Sails Grill/BBQ Night Menu is here (sides change weekly). See all our Sails Restaurant pictures here. Hours: Monday-Friday, 11am – 10pm (bar open until 12 midnight); Saturday-Sunday, 8am – 10pm (bar open until 12 midnight). Features/Good to Know: Full Service; Full Bar; Wednesday is Kebab Night; Sunday is Grill/BBQ Night (steaks, fish (catch of the day), chicken, lobster, etc)! If you have not tried this restaurant as yet, you should make a reservation quickly! I had my Birthday Dinner there and I was so pleased.The staff are attentive, polite and very accommodating. There is a wide selection on the menu and variations are entertained, The food is absolutely wonderful! The ambiance is excellent and if you have a compliment of worthy company, your night is complete. Management please keep up the good work! Sails has become so disappointing. lost reservations, long waiting time for food thats hit or miss, servers who need more training… It used to be a favourite place of mine but I just cant see my self going back. Great Food, Great Service, Great Ambiance!!!! I definitely recommend this restaurant. Sails is my all time favourite eating place. I love the laid back ambience and the food is great. Reasonably priced and lots of it. The margaritas are well worth the wait. Will recommend this place to anyone who will listen to me go on and on and……you get the picutre. Sails is the ultimate eating/liming place.Simple,no-fuss,no-hassle-I think this is called a minimalist approach.Nothing minimal about the experience especially at nights.The ambience is so ,so ,well foreign!That is the best I can do.You feel like you are in a different place because all you see and experience is sea,boats of all kinds,individual lights moving through the darkness,people coming and going in boats which dock next to where you are liming,a pulsating energy of the people as they embark/disembark or as they sit and order from the delicious menu.The Seafood platter for two is excellent.Leaving Sails is leaving an oasis of good food,great ambience,relaxed atmosphere and going into……reality. Thanks for your wonderful feedback on Sails!